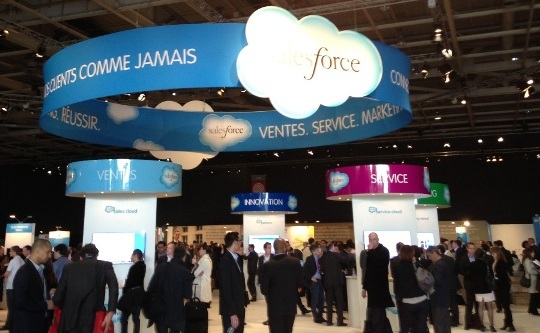 The Paris stop on this worldwide roadshow by the leader in CRM is the Number 1 IT event in France. Preceding the famous Salon de la Relation Client, the event hosted 3,000 people last week: numerous customers (SMBs, CAC 40) and our partner ecosystem (Capgemini, IBM, Accenture…). The EXALEAD OneCall team, led by Benoit Bourdé and Bertrand Martel, attended plenary sessions in the morning, gaining market insights into customer service trends and new tools and channels to respond to challenges faced by contact center and frontline sales agents, no matter the industry. In the afternoon, we met with customers and partners (CSC, Prosodie Capgemini, Accenture, SFR, ST Groupe, B&D…) motivated by OneCall demonstrations presented by the team and by the potential of the solution. Our OneCall positioning was solidified by the testimonials and experiences gained throughout this event. We’re positioning ourselves as the link between the cloud and physical enterprise data to enable smooth customer interaction and to bring a breath of fresh air to customer service and agents.